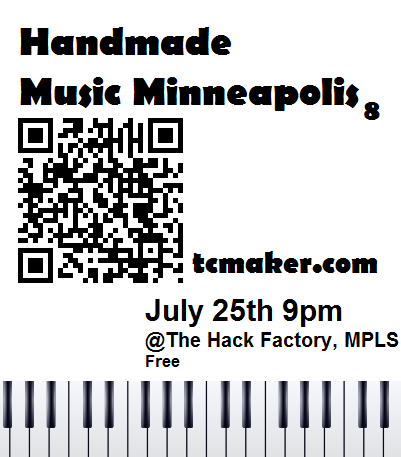 It’s time for another round of Handmade Music in Minneapolis Minnesota. Stop on by. Number 8 will be held on July 25 9pm at the Hack Factory. Rifflord is gonna play heavy music on Handmade gear. Mike Hutchins is gonna talk about that gear. Adam Loper is gonna play his modified organ and leslie cabinet. Bring your ears and toys. The event is free and open to the public.